Pembrokeshire is looking its best at the moment, with stunning displays of spring flowers and skies so blue you could be forgiven for thinking it was summer. The northerly breeze reminds us it’s not August but it helps to keep the skies clear. 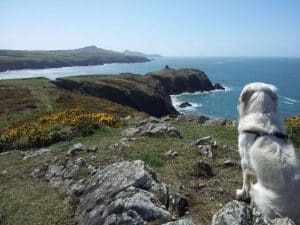 The weather forecast looks pretty stable all week – perfect for hitting the coastal path with the canine boss.